this summer I have been on a mission to get the most out of my ct26 / 440cc setup. I want to run around 18psi. not close to where I wanted to be. 1. bigger wiring / new relay (it was dropping 2v with stock wiring). if your going to run high pressure with a walbro (or others I suspect), you need to drive your pump with as much voltage as you can. 2. adjustable fuel pressure regulator. worth pointing out this mod allowed me go 11% leaner on my piggy back, effectively moving fuel cut up many PSI. 2. stock regulator removed, used a 12mm banjo to-6an fitting on the rail. I had a spare 12mmx1.25 banjo bolt, the blue fitting didn't include that, but was sized for 12mm honda rails/banjo's. *time will tell if this yellow 40a relay will hold up. 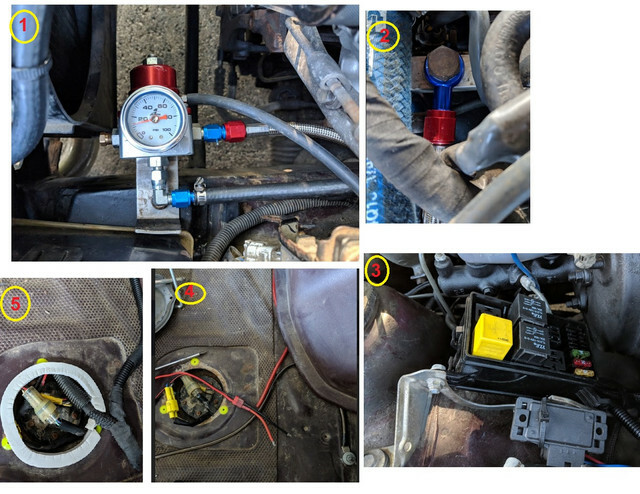 it is activated by the stock ECU pin (grounds out coil and turns pump on) so my pump shuts off if the engine stalls / does not run when key is in ON position. 4. new monster cable (red) from relay to trunk. new large chassis ground. deans style connector (no way I was doing all this and leaving a 30 year old oem connector in there). all in all I am pleased with this upgrade. the pump screams now (yes, its even louder haha) ...and runs .05 volts below battery voltage. I will keep reporting back on this post if/when I find fuel cut. Last edited by madisonMK3; 09-04-2018 at 08:23 AM. Is the unit of "User Tune" a percent reduction in the air flow signal to the ECU? basically. its your mainscale % +- current (map based) tune. had a chance to do some more tuning tonight. for some reason I decided to lower my transition point from wastegate spring only boost (6-7psi) to electronic boost control. on my setup I have a spool setting that does 100% duty cycle (wastegate sees nothing) as it spools up. with this I can make it overshoot my target boost 2-3 psi and spool up harder. found out coming into boost hard around 3500 rpm, you can hit fuel cut at much lower HZ, around 1250, 15-16 psi. but, this was super rich (9:1) as I had a (stupid)tuning error resulting in a +8 instead of a -8 for the 3400 rpm high map tune. so, fixed the tune up. set the electornic boost to come in at 3800-4000 and she is really running nice now. next I need to lean out the 4-5 k area and add some duty cycle to the boost setup. right now its set at 13 psi and overshoots to 15-16 and settles in. also much cooler air on tonight runs. 65 degrees outside. but intake temps were climbing up with the little ct screaming haha. good thing I am running 4gal premium+ 1.5 gal 110 race in the tank. Last edited by madisonMK3; 09-06-2018 at 10:10 PM. had a chance to do some more tuning tonight. for some reason I decided to lower my transition point from wastegate spring only to electronic boost control. 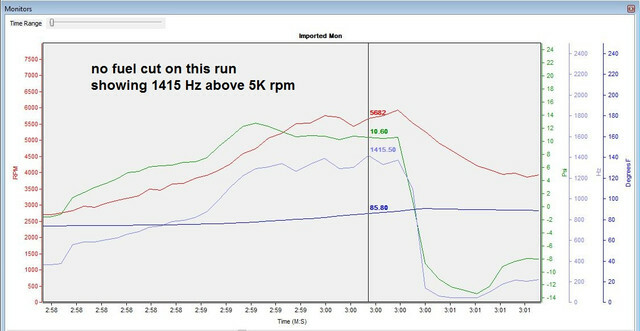 found out coming into boost hard around 3500 rpm, you can hit fuel cut at much lower HZ, around 1250, 15-16 psi. but, this was super rich (9:1) as I had a (stupid)tuning error resulting in a +8 instead of a -8 for the 3400 rpm high map tune. so, fixed the tune up. set the electornic boost to come in at 3800-4000 and she is really running nice now. next I need to lean out the 4-5 k area and add some duty cycle to the boost setup. Very cool. With my 90 the only time I hit fuel cut was right around 3500 rpm. Given what you're saying I probably could have played with the settings in the profec to start limiting boost earlier with a higher maximum allowed boost and squeezed out a little more power. Interesting. Does the MAFT Pro output spreadsheets worth of data? Or just the dyno-style spot results like in your screenshot? If spreadsheets with timestamps, what's the resolution on the timestamps? I'd love to see some high-res data on how the 7M handles things towards that fuel cut limit. yeah the resolution is not high, a tenth of a second . but looking at the software yes you can export a csv. 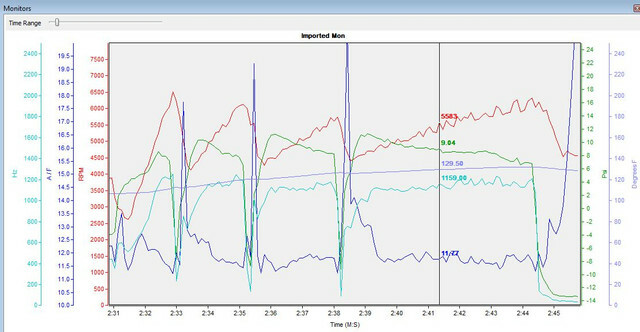 you can see when the fuel cut happens bc the AFR goes up / rpm drops / boost pressure drops. im trying to upload the csv its created but suprafours says invalid file .... :? Last edited by madisonMK3; 09-06-2018 at 10:43 PM. OK, gotcha. Well, if you're so inclined you can send to [email protected]. I'd love to play around with the data. Those numbers were with a massive intake leak (warped flange, forgot to flatten it after welding) and a not so great tune on a Dyno Dynamics at very close to sea level. Peak boost was 16psi at around 5600 rpm, losing boost to redline. As long as you don't get fuel cut, you should have no trouble making the power with your setup. Doesn't the Maft pro have a built in fuel cut eliminator? Last edited by Enraged; 09-07-2018 at 01:41 PM. A point that should be made, though - boost cut is *not* fuel cut - it kills spark not fuel. I believe you'll have no issues making ~350whp on 440's with your supporting mods, but your limitation will be the stock CT26. The compressor wheel is just so damn tiny and no matter how much boost I ran, I never made more than ~270whp on a stock CT. Personally I believe that on a T4 based setup one could break the 400whp threshold on 440's so long as the fuel pump & supporting mods could keep up. Excessive backpressure from the stock CT turbine housing really reduces its overall efficiency above ~350whp or so. On a 62-1 CT26 (not recommended!) and VPC/SAFC/550's I ran as much as 25psi peak boost (falling to 20 by redline) and never hit boost cut thanks to the AFM signal reduction required to map it for 550's w/the VPC. On that setup I made 399whp and 428wtq at 19psi on pump gas but it was 10.5:1 or so in boost to try to mitigate knock count. With 101 octane I just maxed out my boost controller and that was definitely +50wtq and probably a bit more HP but the stock CT turbine housing was choking things off up top in a big way. With a larger turbine housing and better exhaust manifold, even an ancient 62-1 with a .81 T4 housing would likely have gotten me near 500whp on 101 octane. Beyond that, keeping IAT's down with a good FMIC setup is the next step. .... Doesn't the Maft pro have a built in fuel cut eliminator? 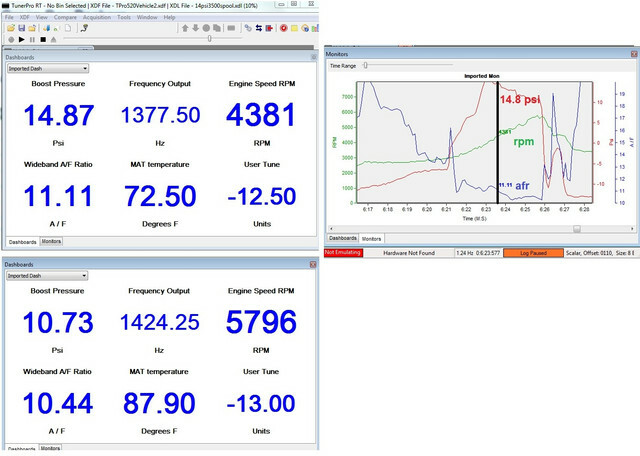 But after seeing the stock ecm activate fuel cut at 1300 ish hz (3500 rpm and below) I am not using the setting. That is incorrect. It is fuel cut. I have personally examined the ECU code and can verify this. If it was spark cut the catalytic converters would be killed the first time you hit it. It is based on computed load by the ECU. The max limit is when the computed load hits about 80% of full scale. Load is computed from air flow, air temperature and barometric pressure. Fascinating. Interesting to have been wrong about such a small detail for so many years. Any other interesting truths found in the TCCS? If it was spark cut the catalytic converters would be killed the first time you hit it. I must disagree. Other vehicles run failsafes on spark cut and not fuel cut and this has not been an issue. Nor has been running profoundly rich been an issue for catalytic converters for relatively short periods of time, such as hitting a failsafe momentarily. Running very rich for long periods of time under high loads will kill cats, but it is not an instantaneous or even short-term death sentence, it's a long term one. It is based on computed load by the ECU. The max limit is when the computed load hits about 80% of full scale. Load is computed from air flow, air temperature and barometric pressure. You wouldn't happen to have a compiled grid of those data, would you? That'd make things easier for the piggyback folks in a big way! ahh its 2018 and the fuel / spark cut debate lives on!! Last edited by madisonMK3; 09-13-2018 at 08:48 AM. I've never seen a production ECU that didn't cut fuel. Filling the engine and exhaust with unburnt fuel doesn't pass the corporate lawyers. But I haven't seen everything. Last edited by 3p141592654; 09-13-2018 at 10:53 AM. Oh I have been following that thread on sm and appreciate the work you have put into it and shared with the community. I use to run a fuel only megasquirt (with the original 7mge ecu handling ignition) and that thread of yours convinced me the a stock turbo ecu + piggy back is a better setup (in many ways, for my HP goals etc) compared to original gangster megasquirt 1.... that thread also made me understand the GE and GTE ecu / wiring are very very similar as well. Im the guy that runs the GTE ecu on a 86.5 yellow plug (modified) GE harness + ge igniter and distributor. When was the last time the injectors were cleaned and flow tested? When I rebuilt the motor, 10 years ~ 10k miles ago I had gb clean/ test them. Last edited by madisonMK3; 09-14-2018 at 04:07 PM. In all my testing with the Emanage blue the highest HZ 've seen without FC was 1625. As you said there is no magical number but as the RPM's raise the amount of HZ from the AFM can rise as well. Maybe 3p can dump that data to make it easily available for piggyback users to set the limits. This is very much the same on the JDM map sensor aristo engines. Depending on the load on my aristo if I had the PSI clamp at 14.5 PSI it would still hit boot cut at lower RPM's if it was too cold and could make too much boost. I recommend upgrading to the Walbro 450, if you don't like the noise. The 450 is so much more quite, but on that note, cheating with more pressure is rough because even the 255 doesn't like pressure as the flow goes wayyy down as pressure goes up. I hit that snag on 550's @ around 527 WHP and 50 base pressure with 26 PSI of boost. @ 76 PSI rail pressure, it got much more lean on the A/F as I tried to add a few more PSI of pressure. 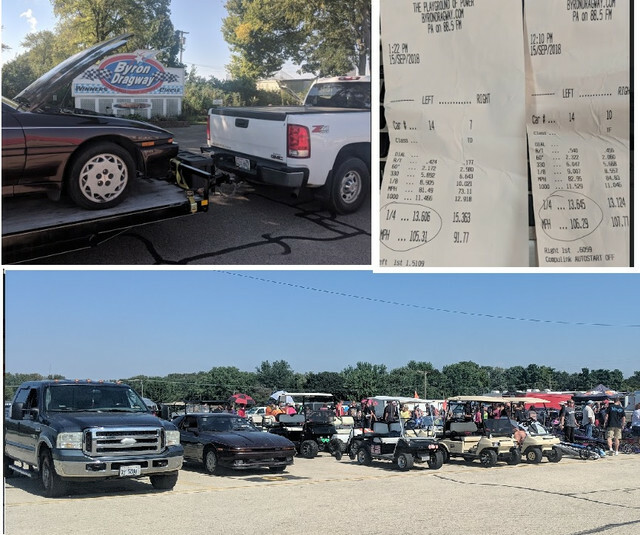 took the car out to the drag strip today to get some real numbers. ran a best 13.60 @105 (personal best for car as well).... but ran into some issues with heat. it was 87 and sunny, my intake air temp pre-run was 110 degrees. my sensor is after intercooler, outside of engine compartment so it does not heat soak. much much hotter than I hoped and also hotter than I had ever tested at. my boost would not go much past 11 psi in the heat. car was hittting 14-15 psi in 70's outside temp, hitting max IAT of 90 or so in testing earlier this week. today I hit 131 degree intake air temp !! glad I had about 100 octane (50/50 mix of 110/93) in her. she was also lean and mean, 11.5 a/f. but I was hesitant to do anything to up the boost since it was so hot. after these runs I am curious to see what I can do hitting 15 psi with 2 digit IAT's.... maybe it has low 13's in it. guy next to me trapped 2mph higher in a mustang and ran 13.04. Last edited by madisonMK3; 09-15-2018 at 04:10 PM. have you considered water/meth injection? 105mph is the highest trap speed I've ever heard of from a 100% stock CT26 in a full weight MK3. added more turbo to the equation this year. ct26 rebuilt with 57 trim mamba wheel 11 blade with matching mamba compressor cover. have only done minimal tuning with the new turbo, but here we are hitting 15psi on stock 440's. somehow not hitting fuel cut. base fuel pressure (engine off) is 50 psi. at idle we are at 42.
apparently fuel cut is based off rpm as well as I can hit very high frequency out HZ (1700) at 6000+ rpm. Last edited by madisonMK3; 04-13-2019 at 04:22 PM. Raising fuel cut with stock AFM.